On/Off thermostats should be used for controlling the temperature of non-light emitting heat sources only. Maximum load of 100w. 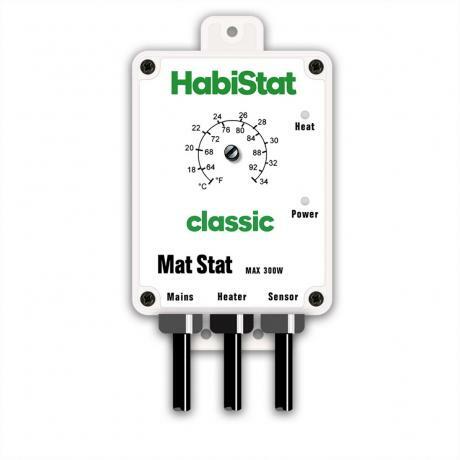 What are HabiStat Mat Stats used for? Thermostats are well known to be some of the most important pieces of equipment for the vivarium. They are used purely as a prevention device to stop accidental overheating and to have a greater control of the enclosure temperature. These particular stats are an on/off device, which simply means they switch off when they reach the desired temperature, and switch themselves back on again when the temperature starts to drop. You can select the temperature by adjusting the centre dial with a small flat headed screwdriver and setting it at your desired temperature. These devices are only suitable for use with heat mats and ceramic heaters. If you're looking for something to use with basking bulbs, please see dimming thermostats.